Picturebooks are a parade of deadlines. The big ‘lines’ in the process are for the final dummy and the completion of finished art, but inside that whole process are mini deadlines. New dummies or art for Bologna, for Frankfurt, a sample cover for a sales meeting, colour work for a catalogue. A couple of weeks ago Michael pulled a 24 hour day to get some work done for a sales meeting. The request was a bit sudden and we had a friend coming from the US for a few days, so Michael did a few hours each day while our visitor slept in, then got seriously stuck in as I drove our departing guest to the airport at 7am Sunday morning. He worked straight through to 7am the next day. That Sunday happened to be our wedding anniversary so I was a wee bit miffed, but completely sympathetic. Right now I’m the one crunching. I’ve spent the last month getting as much art as possible done in time for the Frankfurt book fair, and now I have one month to complete the book. I can do it, if I keep my head down. I won’t try any crazy 24 hour stuff – the day when I could is long gone – but I will work steadily and keep going in the evenings and through the weekends. And I’ll try not to channel my inner Douglas Adams, who famously said, ‘I love deadlines. I love the whooshing noise the make as they go by.’ Though if I were to pull out my contract with Walker Books I’m pretty sure the official delivery date was May. This year. 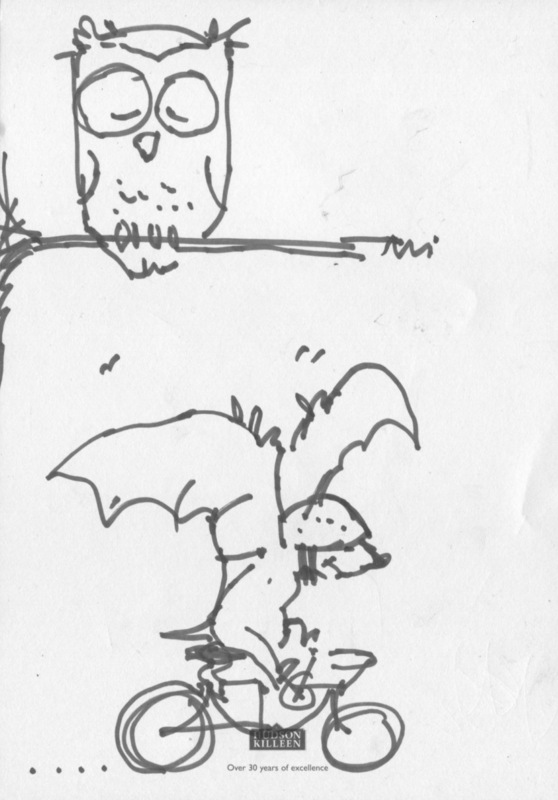 Michael (as a bat) whooshes away on his bike, with me (as owl) sleeping in. Most recent ‘Gone Cycling’ note from Michael. This entry was posted in Marie-Louise Fitzpatrick, Michael Emberley and tagged deadlines, Douglas Adams, Walker Books by The Belugas are Watching. Bookmark the permalink. Absolutely, Kevin. I count myself lucky to think ‘damn, is it Friday alreadY?’ !